Set up the weightpull training in the downhill kennels on the flat (the only flat parcel of the whole property and it still isn’t all that flat). The drags, the harnesses, went and got Emmer. 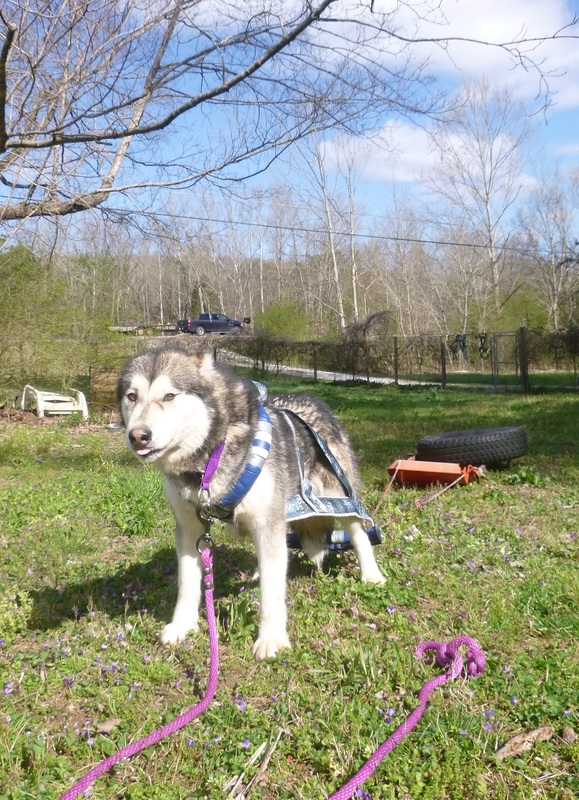 Left Yodel in her kennel and she lived up to her name. 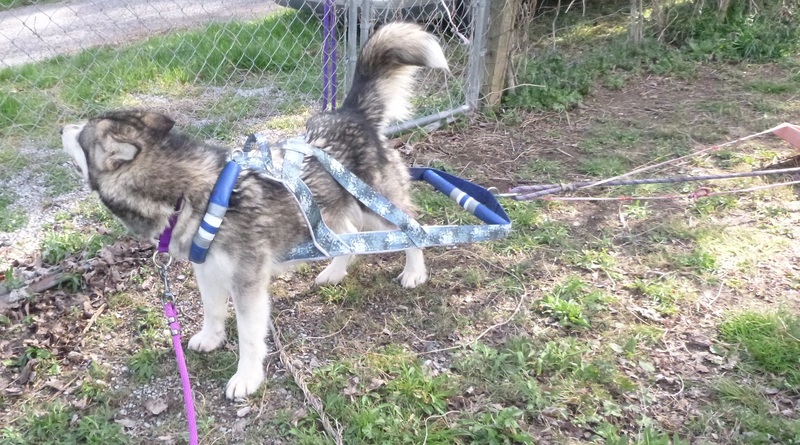 Emmer inspected all the harnesses, the drags, was happy and tail up. 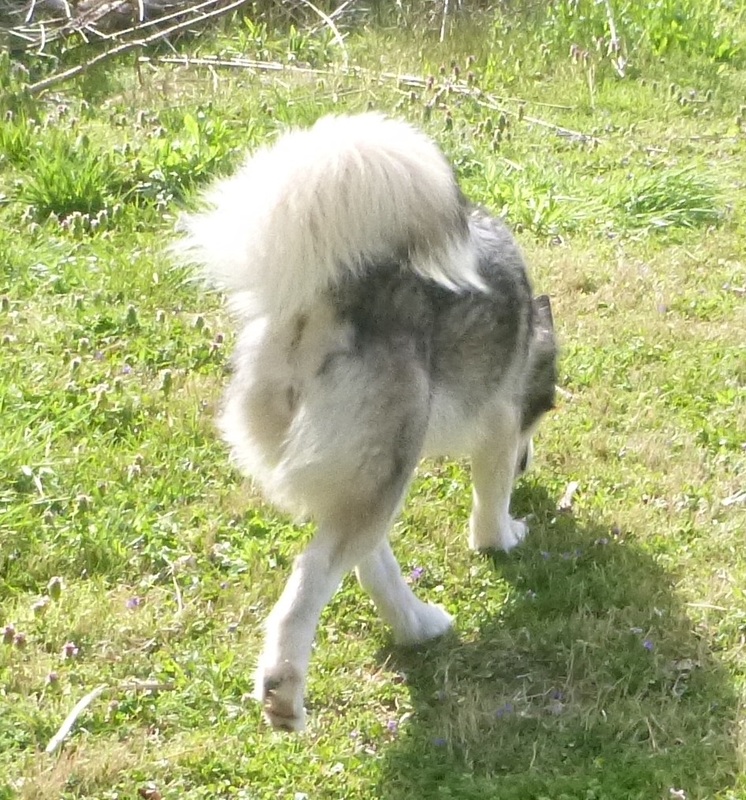 Tails are a barometer for most sleddogs. But you have to combine those signals with ears and eyes. It’s not as simple as saying, Oh, he’s wagging his tail, he must be happy. 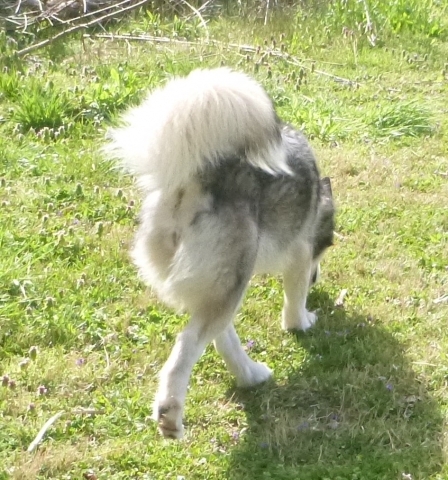 A tail wag is one part of the whole-dog expression. It can be a CONFLICT signal. It can mean: I’m so happy to see you, leader-o-mine, but I’m also a little concerned that you may not be as happy to see me, so watch my eager puppy displays! A dog can be wagging their tail in submission while they bite in warning. A dog can be wagging their tail in joy while they chase tennis balls. You have to watch expressions, including eyes and ears. And tongues even. An extended tongue can be a heat reaction, it may be a relax expression. I mention all this because I’m evaluating the dog’s body language to determine success. NOT whether they can do the work, but whether they enjoy it. This isn’t some New Age touchy-feely thing. If the dog is happy through each stage of the training, they will be better at it when it gets harder. And you also have to factor in that a hard-working dog will often drop his tail because he’s working hard, not because he’s unhappy. 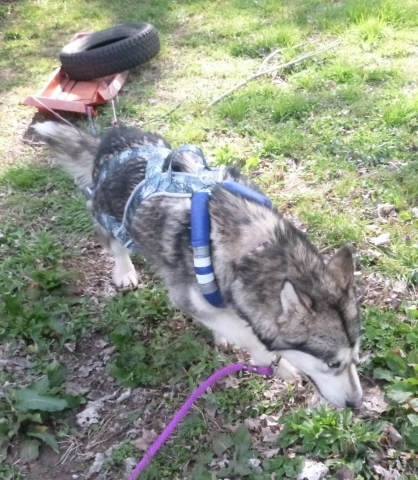 Emmer was happy to see the harnesses, to sniff them all over, to inspect the drags, and come over to me, wagging all over, and inspected my vest front…. oops, I may have dripped breakfast. 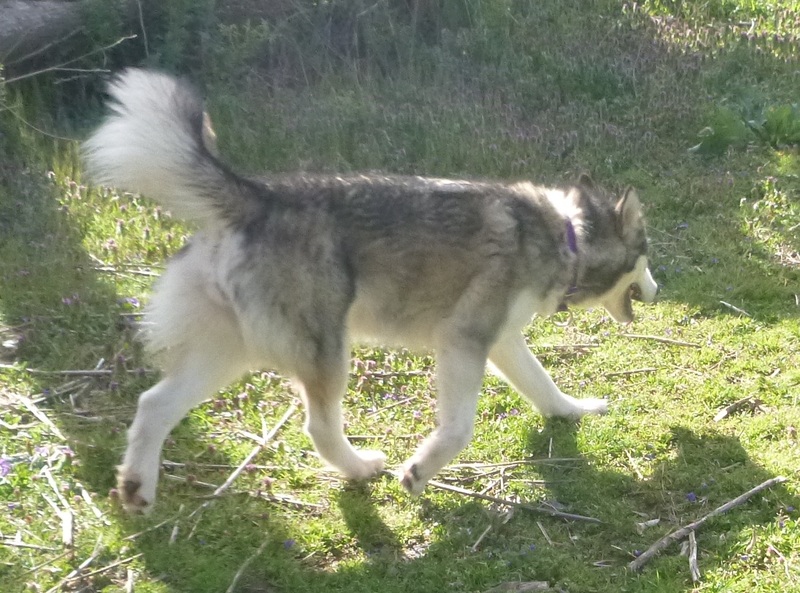 Check her body language, not just tail, but expression and ears. She starts out with her tail up and face relaxed, see the first 2 pics. This is her happy body language. I dressed her and she was fine with that. We walked around the big yard, and it took her only a few steps to figure out she could line out with the leash on the tugring. 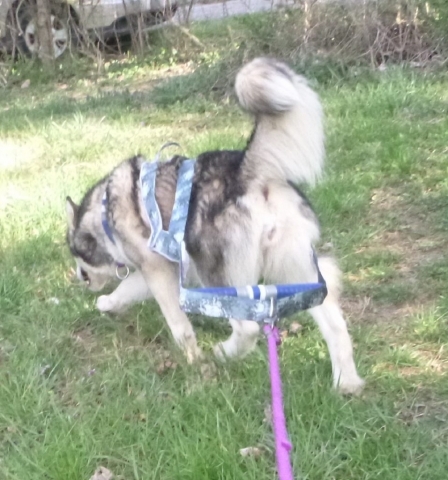 We got all the way back around to the drags and her tail was up, wagging. So it was time to add weights. 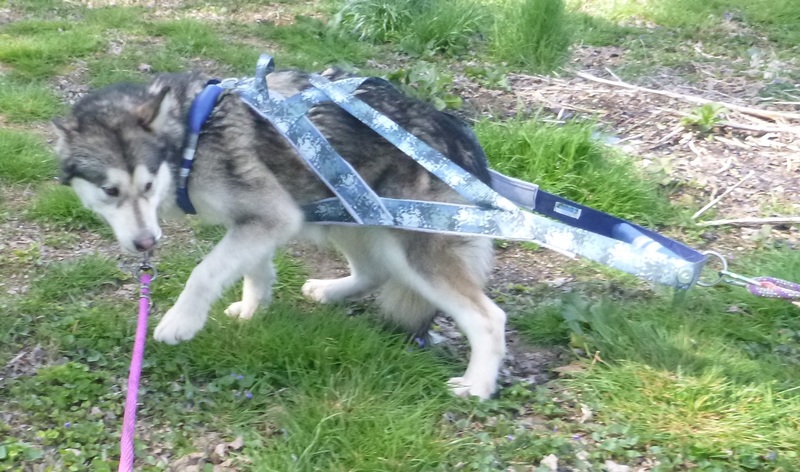 The empty sledge was fine, she trotted along, tail up, head up, sniffing, interested in her surroundings, simply happy. Then I added the tire to the drag. Instant obvious problem (picture 5, 6, 7 & 8). Tail not just down, but tucked, face worried, back hunched. Coaxing didn’t work. Bribery didn’t work. So I removed the tire, and we did a last happy round with just the sledge… note the tail in the last pic. There is a huge disparity in tail carrige for Emmer. There is tail up, tail down, and tail tucked. A tail tucked is a very unhappy dog. Same problem as Emmer. Easy success getting dressed, aside from some giddy spins and twirls. She settled. Then we walked the perimeter with her being praised every time she pulled the tugline tight. She did some spinning again, which I verbally chastised, “angh-angh,” and then she settled. Hooked up the empty drag sled, we trotted along, tails up. 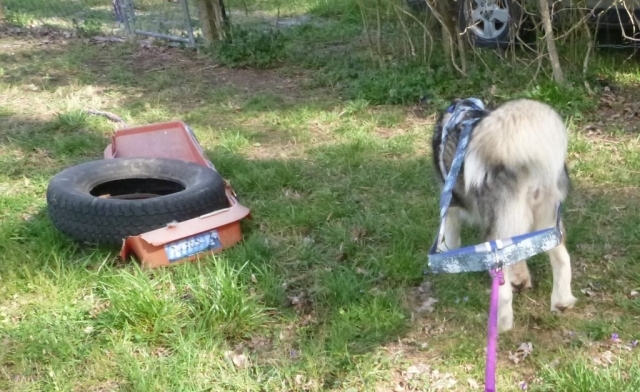 Added the weight of the tire and… instant sag of enthusiasm. Looking back over her shoulder, concerned face, head held lower. Lots of encouragement, a little subtle help via the leash hooked to the nape ring on her harness, but she was just overwhelmed. So stepped down a notch and took the tire off so she could pull the empty sledge. Instant Happy Tail. 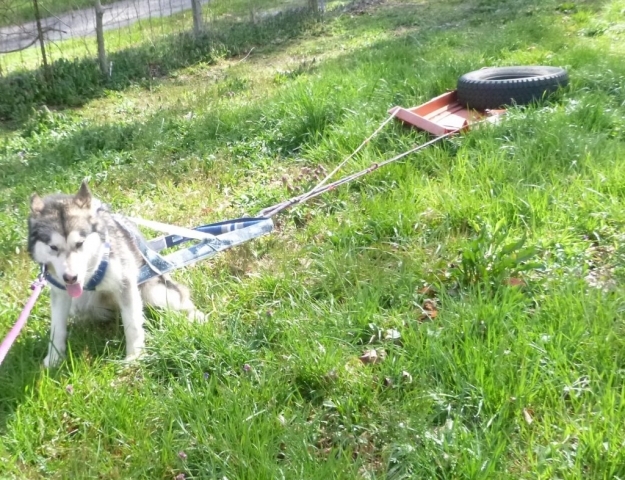 So, I need an intermediate step between empty sledge and sledge-weighted-with-heavy-tire. I need to find my MIA small tire.